In 1984, a very selfless thing happened in London that profoundly changed how music is used for good. 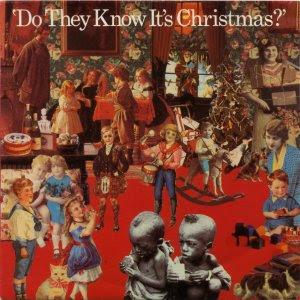 Bob Geldof recruited a bunch of his industry friends and along with Midge Ure wrote a song to be used to raise money for starving people of Africa. The song was recorded under the name Band-Aid and was made up of a collection of the biggest pop talent of that time. 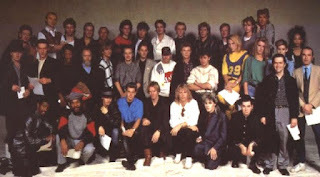 Along with Bob and Midge, some other artists who lent their talents included, Paul Young, Duran Duran, U2, Phil Collins, Paul Weller, Heaven 17, Banarama, Culture Club, Kool and the Gang, Sting, Spandou Ballet, George Michael, Jodie Watley, some dudes from Big Country and a freak called Marilyn ripping off Boy George's shtick. Even David Bowie left a personal message on the extended remix of the song. The video, as expected, got massive air play and did raise a lot of money for the cause that led to a multi-country Live-Aid concert and American artists to do their own song under the name U.S.A. for Africa and Canadia artists under the name Northern Lights. It also propelled Bob Geldof as the poster child for famine relief and also led to a Nobel prize and a Knighthood from the Queen (the real one - not the band). Honestly, Bob deserves nothing but praise for his efforts but as expected, he also became a target. He couldn't have a meal in a restaurant without some reporter asking him how it felt to eat with so many people starving in the world. What the hell is wrong with people? Bob did more for charity in one day than most people do in a lifetime. Think about that as you go for seconds this Christmas.